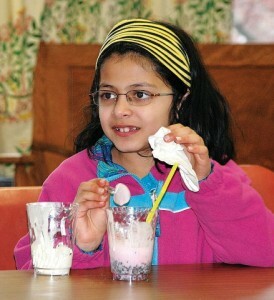 Shrewsbury – Yashika Gandhi, 8, samples the “edible aquifer” she created during a fun and educational program presented April 20 by the Shrewsbury Water Conservation Project at the Shrewsbury Public Library. John DeCillis, the town&apos;s water conservation coordinator, taught children the importance of water conservation as the population grows and the amount of water stays the same. To better understand an aquifer, each child replicated one with cookie crumbs, chocolate chips, ice cream and soda to symbolize water-bearing plants, gravel and soil, and a straw to symbolize a pumping well. The children enjoyed eating their project and were given a reusable water bottle to take home.